With more choice available locally, I’m now hooked on pink wine. There’s something about a Rosé. Neither white nor red but ranging in colour from onion skin to salmon to a bright cherry, it’s such a pretty colour that just swirling it in my glass puts me into a good mood, says Reva K. Singh. These light, refreshing wines, once dismissed as coming from lesser quality grapes than those used for red wine, have made a comeback as wine makers pay them greater attention and better quality Rosés, including pink Champagnes and sparkling wines, come on the market. In some parts of the world Rosés never really went out of vogue – in France, for example, especially in the warmer southern region. Here, Rosés are enjoyed for their light, fresh, dry character as wines that still have a resemblance to the red wine that is so well loved by the French. Provence is the French region famous for its Rosé, but rosés are also produced in the greater southern Rhône, especially Tavel, the Languedoc and Roussillon, where they are as popular as white wines. Anjou in the Loire Valley is another region known for rosé, such as Rosé d’Anjou or the more upscale Cabernet d’Anjou. Good rosé also comes from Spain. The best Spanish producers make it from specific batches of grapes picked from young, high yielding vines grown in cooler areas, which improves their quality. The lighter coloured variety is known as rosado, while the darker pink wines are called clairete. Portugal exports most of its better known rosés such as Mateus and Lancers. Italy is not really known for rosé but some wine estates do make them. Grape varieties Theoretically, rosé wine can be produced from any grape, but some varietals are better or more traditional. In southern France the grapes most often used are Grenache and Cinsault. Pinot Noir is used in pink Sancerre and is also the basis of many California rosés. Syrah or Shiraz and Tempranillo in Spain are other grapes used to make rosé wines. Indian rosés including Indian sparkling wines are made most frequently from Shiraz grapes. Method To make rosés, red wine grapes are macerated on the skins for a short period to extract a certain amount of colour, tannins, and phenols. After that the juice is separated from the skins by draining or pressing and then fermented, as for white wines. The traditionally used Grenache requires about 8 to 12 hours of maceration while other strongly pigmented grape varieties may need much less time. This method is also known as saignée which is a French term meaning ‘bleeding’ or extracting free-run juice from just-crushed grapes after a short maceration. Some basic rosés are made by blending a small amount of finished red wine with white wine. (Vinsura’s rosé is a blend of Chenin and Zinfandel.) 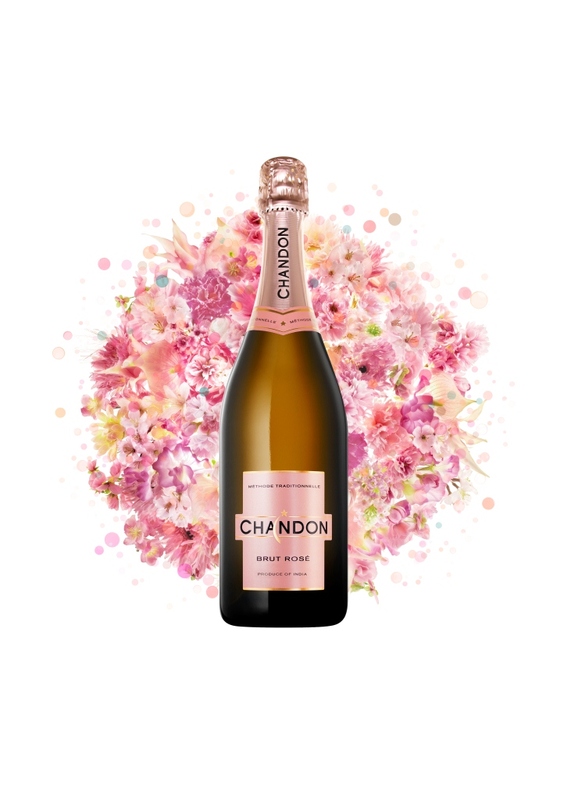 This is a method that is not generally favoured or officially approved except in Champagne, which produces some extraordinary pink bubblies, like the Veuve Clicquot Ponsardin Rosé 2000 I tasted recently, in which the white wine was blended with 8% red wine. Blush wines are a very pale pink American style that became popular in California in the 1980s and were promoted as White Zinfandel. Most of these wines are sweet, slightly aromatic and faintly fizzy. But it’s the dry Rosé that is more popular today. A good dry Rosé, served lightly chilled, combines the refreshing qualities of a white wine and the richness of a red. So Think Pink when choosing a wine for your Valentine this season, but at other times too. A Rosé has more character than a simple white and isn’t as heavy as a light red. Look for a style that suits your palate.There are Rosés that you might find too sweet or too simple or too lacking in fruit. Rosés complement a wide variety of foods including spicy dishes, and even the top quality are good buys. Grover Art Collection Shiraz Rosé Rs 510 in Goa, Rs 550 in Maharashtra and Rs 615 in Karnataka. Not available in Delhi.